The Upper Cervical spine is the "Houston Control" of the body. Upper Cervical Care is a unique type of chiropractic care that focuses primarily on the relationship between the top 2 bones in the spine and the base of the skull. This area houses the base of the brain called the brainstem and upper spinal cord. Often referred to as “Houston Control” of the body, this part of the nerve system controls and coordinates virtually every function of the body. Therefore, when we address this Primary Condition we can affect many Secondary Conditions throughout the body. This head and neck misalignment known as an Upper Cervical Subluxation occurs when one or both of the top 2 bones in the neck misaligns relative to the skull and rest of the spine. A displacement in this area can cause 2 major dysfunctions that are often the cause of many Secondary Conditions. An Upper Cervical Subluxation causes dangerous pressure and stresses on the lower brainstem and upper spinal cord. This interferes with the optimal normal function of the entire nerve system. Simply stated, any part of the body that does not have normal communication will not function properly. 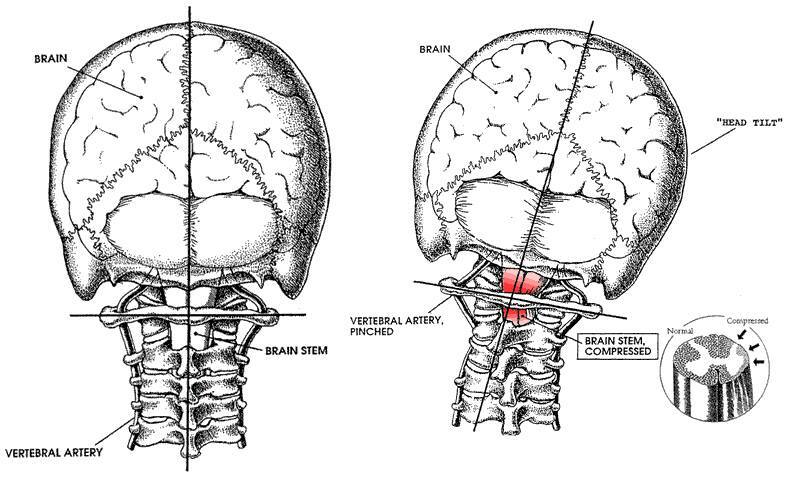 A displacement in the Upper Cervical spine will cause the head not to be on straight. The entire rest of the spine will bend and twist to try to keep the head as level as possible. This is why many musculoskeletal problems in the shoulders, mid back, low back, hips, and legs are ultimately a result of the Upper Cervical problem. Correcting the upper neck problem will allow the alignment and fixation issues in the rest of the spine to return to optimal structure. The process of correcting the entire spine beginning with the Upper Cervical area is called Corrective Spinal Care.